Give an Asian a piece of ginseng, and they will likely squirrel it away to boil a bowl of nourishing herbal soup. No Asian worth their salt will turn down good ginseng, a root known to boost blood circulation and energy levels; and that is also true when that ginseng is found in skincare. The Yehwadam range is what is commonly referred to as the “anti-aging” range, and is targeted at those 35 and above. I can understand why, because the textures of the products are noticeably heavier and are more suitable for those with a drier skin type. That is of course, not to say that you can’t use it if you’re younger. If you have oily skin then the textures of some of the products may not feel as comfortable. They aren’t sticky or greasy, just noticeably heavier on skin. The upgraded and improved Yehwadam Heaven Grade Ginseng Rejuventaing range also contains canola, peony, gold dust, safflower seed oil, Lotus flower extract and double the concentration of the key ingredients, Heaven Grade Ginseng and Natural Pine Mushroom. One thing I have to note right at the start is this – the packaging is stunning! The elegant bottles are weighty frosted glass or plastic, the plastic caps and pumps are sturdy and solid, and it feels very luxurious! This will look welcome on any dresser! This one is more of an essence than a toner, if you ask me. For those with drier skin (that this range targets) this toner will feel more comfortable. On oily skins, it may feel heavy. It does absorb quite easily, and I’d just use my hands to apply so I don’t waste all that lovely lotion on a cotton pad. Just squirt one pump in the palm of your hand, warm it up, and apply to skin. I do find that if I apply it to damp skin (after misting), it seems to make my skin feel a little more plumped. I like the liquid texture and how quickly and easily it absorbs, and how my skin feels immediately after – comfortable and hydrated. But there’s one thing that bugs me, and that’s the scent. I was expecting a herbal, earthy scent akin to that of ginseng. I love the smell of herbs so that would have sat well with me. However, this range is perfumed and I personally find the scent of flowers too strong. That said, scent is a very personal thing, so I will suggest that you test it yourself and see how well it sits with you. The Rejuvenating Serum has a thicker, creamier texture than I’m used to. Not that I’m complaining, because I enjoy creamy textures like this. But this once again underlines the fact that this range is better suited for someone with drier skin. I use 1 pump, which is about the right amount, warmed up and then smoothed over my skin. It is creamy, but sinks in very nicely into the skin, so there is no sticky feeling. In fact, it feels almost silky, which isn’t surprising, as it contains silicones. To be honest, because I already take good care of my skin, I cannot tell you if I saw any dramatic results using this serum. It was alright, but if I’m to be honest, it’s not my favourite because of the texture (I generally shy away from products that contain too much silicone) and the ever-present fragrance that I feel seems stronger in this one than the rest. These are the textures of the Yehwadam products I’ve featured here. I think it’s useful to be able to see because the textures of each product is quite different! This would be the moisturiser for most people. The texture, as you can see from the picture above is that of a light lotion. It is very light, and almost seems to sink right into the skin. For me, that is almost quite literal. The first few days, I applied this over the Revitalizing Toner and the Rejuvenating Serum. But I soon realised that it was not moisturising enough for me. I noticed that there is a Revitalizing Cream in the range, and I have a feeling that might suit me better. 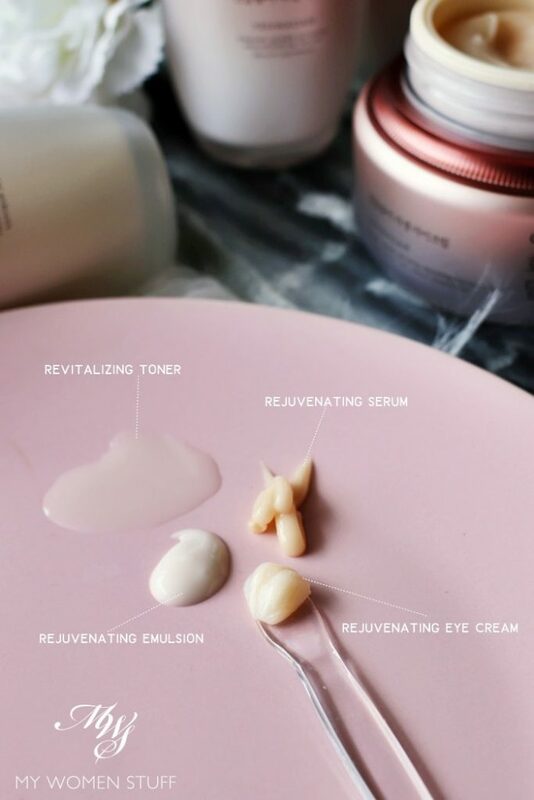 However, if you feel that the Rejuvenating Serum is a little heavy, and don’t want anything heavier on top of it, then this emulsion might do the trick. I do like it in terms of its milky texture, and how it feels going on the skin. It just isn’t enough for me, which is no fault of the product. Ah, this is the piece de resistance of the Yehwadam range in my eyes! First, I just have to gawk at the size of the tub! 25ml for an eye cream is no joke! Usually, we’d be lucky to get 15ml. Funny story: The first day I started using this Yehwadam Heaven Grade Ginseng Rejuvenating range, I didn’t really pay attention to the boxes. I mean, what don’t I know about how to use skincare right? So I happily slapped on the Rejuvenating Toner, and then the Rejuvenating Serum and then the Emulsion. 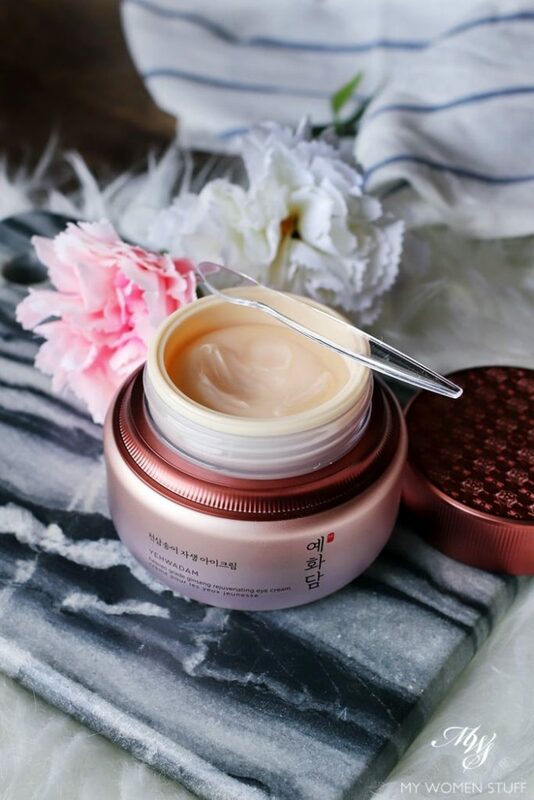 Next, I opened up this GIGANTIC tub of cream, oohed and ahhed at the lovely creamy texture that looks almost like a balm….. and then applied it all over my face! Nothing untoward happened, and if anything, I swear that this makes for a very lovely face cream! 😀 The texture is thicker than most eye creams I’m used to, with an almost balmy feel. Yet, when you warm it up, it becomes very light, and it is so easy to apply it around your eye area. It absorbs nicely and keeps the eye area hydrated, which is what a good eye cream should do. I had absolutely no problems with this one, although if you have oily lids then you might want to stay away to avoid potential clogging. Otherwise, this is very lovely, nourishing and comfortable. I cannot say that I noticed anything dramatic happening around my eye area (I don’t have very deep wrinkles around my eyes – I know, lucky me!). That said, considering that I am the laziest person around when it comes to using eye cream, I found myself reaching for this tub often. A note about fragrance, because I have been banging on about it, it is similarly fragranced, which I’d much rather it wasn’t. But because you use very little, the fragrance is less noticeable than in the other face products. 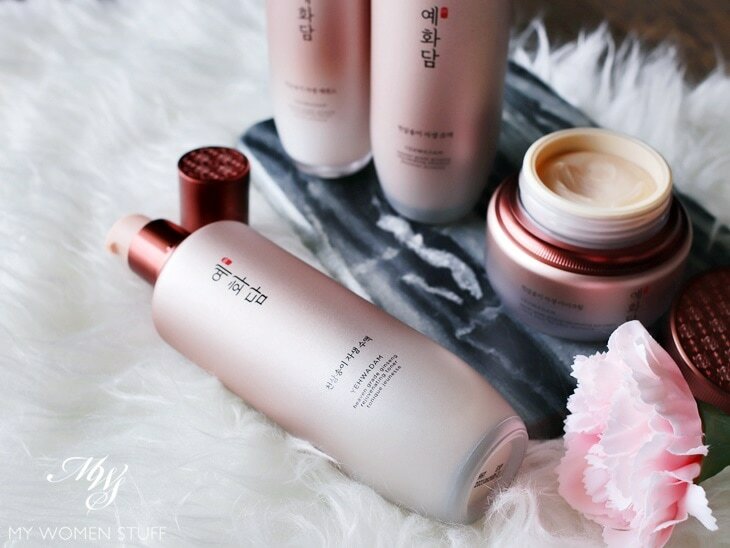 Overall, I’d say that THE FACE SHOP Yehwadam Heaven Grade Ginseng Rejuvenating range is, texturally, best for the target age group of 35 and up, or for those with drier skin types. If smoothing winkles and lines are your concern, I’d say it’ll take a while for you to notice a difference. As I said, I already care for my skin, and I am not genetically pre-disposed to have a lot of lines. So, it was hard for me to measure this. I can therefore only tell you about the texture and how I feel using it. I personally find the fragrance a little strong, and too floral for my tastes. If it had smelled more of herbs and ginseng, I’d be more comfortable. But that is how my nose is wired – I don’t even like floral type perfumes, so it’s not unusual that the scent did not sit too well with me. My personal pick would be the Rejuvenating Eye Cream. It is great value for money because it’s such a huge tub of cream, and I love the balmy texture on skin. The Rejuvenating Toner is alright, if you’re in the market for a heavier lotion, more like an essence. I was not too much a fan of the texture of the Rejuvenating Serum, but I’m told that is a bestseller product, and that tells me it must be effective! The Rejuvenating Emulsion would be good for a day moisturiser, if you have combination type skin. I have dry skin and I did not feel it to be sufficient, even layered over the Toner and Serum. 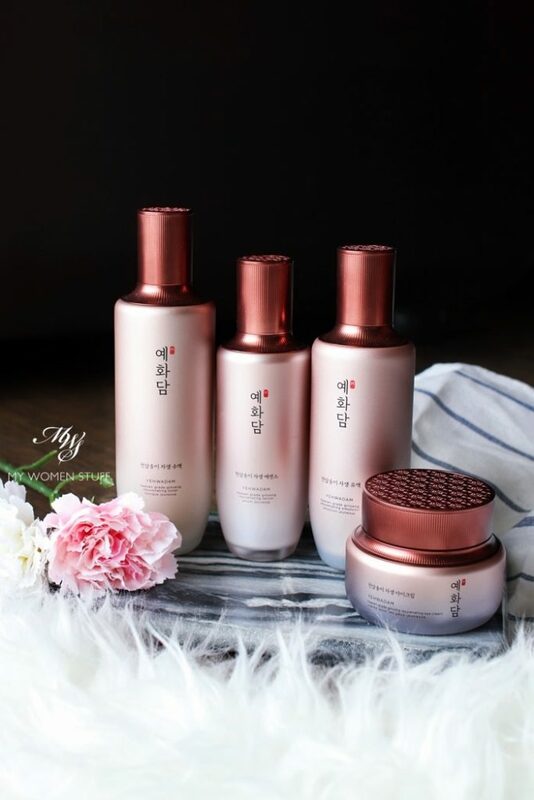 Have you tried previous The Face Shop Yehwadam skincare? Or any other ranges maybe? Disclosure: Featured products were provided as part of a partnership with The Face Shop. Our commitment is to honesty and fairness. For review guidelines please read the disclaimer. NEXT POST: One good tip to contain clutter and find things more easily – have a landing strip at home! I have never heard of this brand, but I have a Sulwhasoo Ginseng Serum in my stack, can’t wait to try it. Ginseng products are hard to find in Europe. Printemps Paris (Blvd Haussmann) is the only stockist of Sulwhasoo outside of Asia, as far as I know. Oh Maja, Sulwhasoo can do no wrong in my eyes! LOL So dramatic I know 😛 But I do love most of their products and I love love the smell of ginseng that permeates through their formulations! I am going to try their ginseng serum too, but if you have the chance, do try the Ginseng cream. Oh my! I’m so much in love with it! It is very expensive, but it is sometimes found in the smaller size in a set (Korean brands make very good sets that are value for money) so it’s worth trying then. I’d love to know your thoughts on it if you do! Thank you for the recommendation. Have a wonderful day! My mom gifted me the eye cream from Korea when she visited family there. I too was surprised at how large it is! But it also costs quite a bit. However since there’s so much and my skin is pretty dry especially during winter, I’ve been using it as a face cream too. Yes I agree that the price does surprise me a little, because the brand isn’t quite a premium brand. But I think it is because of the range, which is a more premium range. But isn’t that eye cream quite something?! I did enjoy using it as a face cream too haha! I swear, I was thinking “Wow, this is quite a nice cream!” and then when I found out it was an eye cream, I thought “darn!” LOL! Hi Paris, I found out that Zalora is having promotion for this range. Will check out the product in store to smell the scent first.. hehe.. Also I like the way you arrange the products so that we can compare the texture in one photo. Hi Paris, me 41 this year. So I shall stick with my anti aging range now. Thanks so much for the info. Also thanks for the review of Sulwashoo. Same type of jar design – colour, shape, size… Almost 90% lookalike… ginseng also..
Can this series replace Sulwhasoo essential series? Sulwhasoo is good but too expensive for me to buy the full range. I found this series got promotion and can get up to 35% discount which is much more cheaper than buying Sulwhasoo. Yeah, I purchased a toner during 35% sales and I got it today. The toner looks good for me. Thanks for your comment. I am using Sulwhasoo essential range but quite expensive for me and looking for a cheaper replacement. Hopes this range work as good as Sulwhasoo essential range or even better like you said! Alaaaaa.. Looks like it won’t be able to replace Sulwhasoo in my dictionary ?